Posted on July 14, 2007 by Chad O. We are playing catch up and starting to add more laptops to the site. One of those we haven’t added util now is one that is starting to get a lot of attention, the ASUS U1F (maybe referred to as ASUS U1 depending on location). It’s a very sleek looking ultraportable laptop, selling for around $2200 USD (see ASUS.com for pricing in your location). It has an 11.1-inch widescreen display (1366×768) that is LED-backlit, and partially because of that, it is less than an inch thick (as thin as 0.7 inches). Along with the LED-backlit display Intel Core Duo U2400 (Ultra Low Voltage) CPU and lack of an internal optical drive help keep the weight down to under 2.5 pounds. An external Blu-Ray optical drive makes it one of the first ultraportables to offer that option (granted, it’s not internal, but it’s a tradeoff). In the next few months, you’ll be seeing more and more PC makers implementing LED backlights into their laptops. The ASUS U1F is one of the first of what’s sure to be many ultraportables packing LED technology, and that and most of its other features earn it a clear thumbs-up. Still, you may find yourself missing that optical drive. 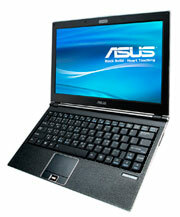 This entry was posted in Announcements, ASUS, Blu-Ray / HD DVD, LED Backlighting, Reviews. Bookmark the permalink.